Aqua Aura is created when Clear Quartz crystals are super-heated in a vacuum and infused with vaporized Gold. This precious metal condenses onto the surface of the quartz crystal to form a permanent bond with the lattice of the quartz. They are excellent stones to aid you to speak more easily and more truthfully with those with whom you may have relationships. 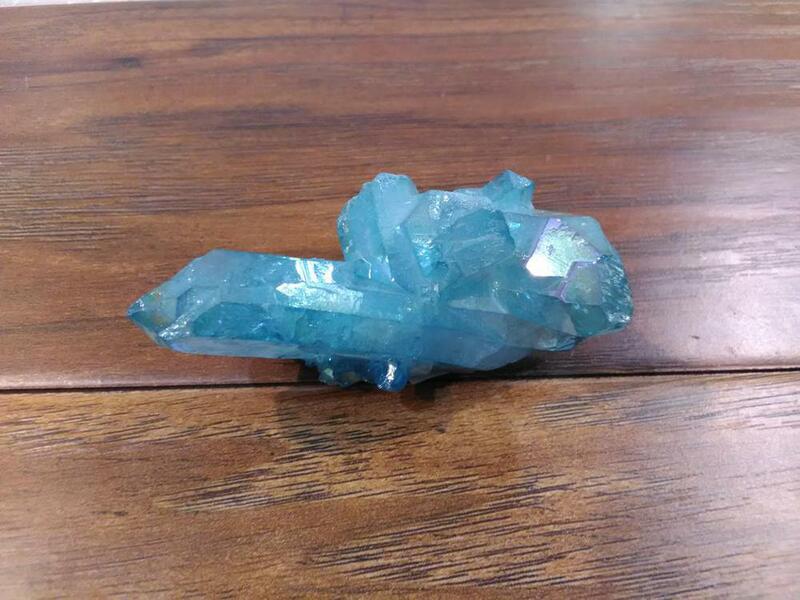 The blue color of Aqua Aura Quartz is a clue to their strong capacity to aid your emotions and help you to feel calmer and more at peace emotionally. Aqua Auras vibration of these bright blue crystals is particularly active at the throat chakra, and it is also quite potent within the thymus or higher heart and heart chakra, aiding heartfelt communication with others.